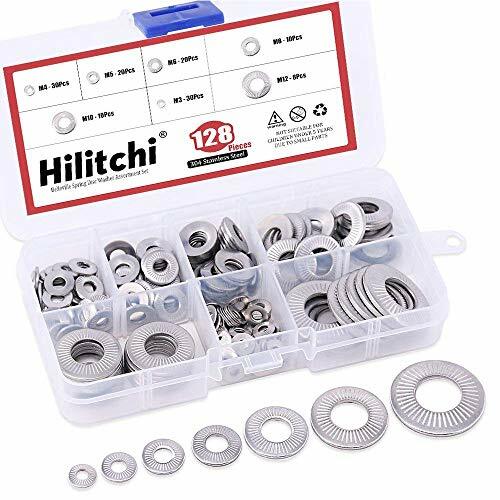 Hilitchi 128-Pcs High Quality 304 Stainless Steel Belleville Washer Assortment Kit Specifications - Washer Type: Belleville Washer - Sizes: M3 M4 M5 M6 M8 M10 M12 Metric, please See Picture 2 for Specific Dimensional Size - Material: 304 Stainless Steel - Color: Silver Tone Features - Made of 304 stainless steel material, very good corrosion resistance - Belleville spring washers are especially suited for applications requiring high spring rates in restricted space - they will occupy only a fraction of the compressed height space of a traditional wire spring. 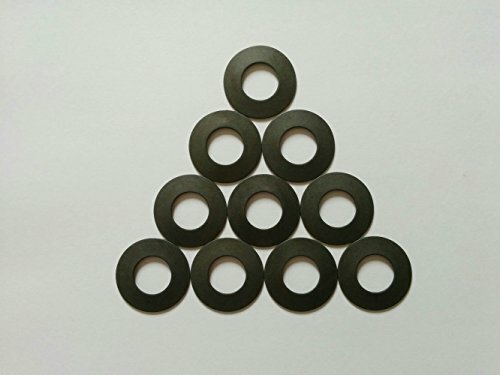 - The Belleville washer also called cupped spring washer or conical washer,is a type of spring shaped like a washer.it has a frusto-conical shape which gives the washer a spring characteristic. (from wiki). 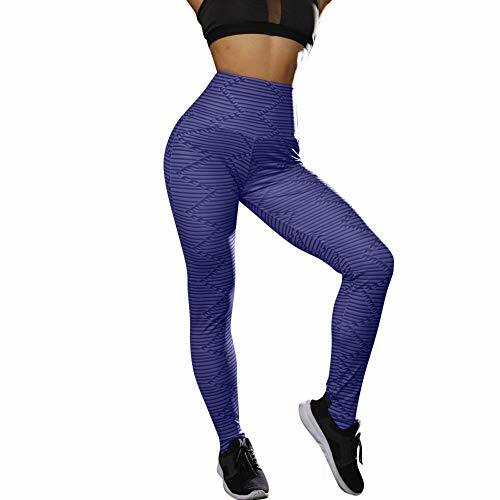 - This set is organized by size / type in a transparent storage case for quick access and protection Package Included - M3 - 30Pcs - M4 - 30Pcs - M5 - 20Pcs - M6 - 20Pcs - M8 - 10Pcs - M10 - 10Pcs - M12 - 8Pcs Package Quantity: 128pcs This set is organized by size in a transparent storage case for quick access and protection. Hilitchi is a professional company of fasteners. We sell steel, stainless steel and brass screws, self tapping screws, self drilling screws, dry wall screws, hex nuts, hex bolts, rivets, anchors, nails, flat washers, spring washers, couplings and fixings. 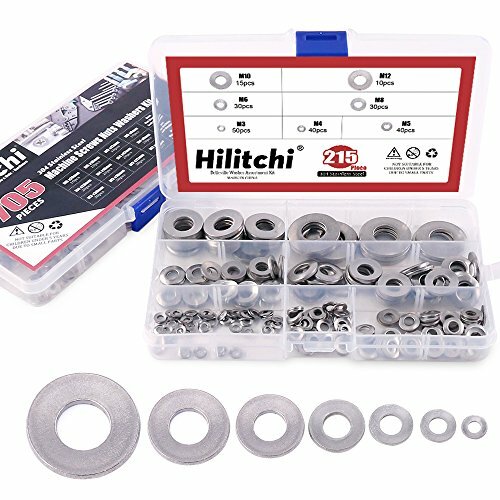 Hilitchi 215-Pcs High Quality 304 Stainless Steel Belleville Washer Assortment Kit Specifications - Washer Type: Belleville Washer - Sizes: M3 M4 M5 M6 M8 M10 M12 Metric, please See Picture 2 for Specific Dimensional Size - Material: 304 Stainless Steel - Color: Silver Tone Features - Made of 304 stainless steel material, very good corrosion resistance - Belleville spring washers are especially suited for applications requiring high spring rates in restricted space - they will occupy only a fraction of the compressed height space of a traditional wire spring. - Belleville washers can be stacked in varying sequences (parallel and/or series therefore offering numerous load-carrying possibilities. 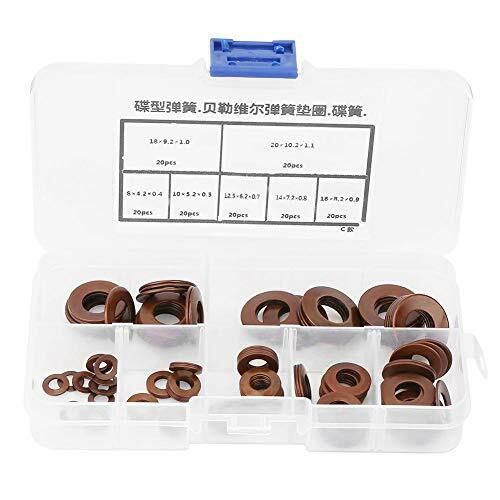 - This set is organized by size / type in a transparent storage case for quick access and protection Package Included - M3 - 50Pcs - M4 - 40Pcs - M5 - 40Pcs - M6 - 30Pcs - M8 - 30Pcs - M10 - 15Pcs - M12 - 10Pcs Package Quantity: 215pcs This set is organized by size in a transparent storage case for quick access and protection. Hilitchi is a professional company of fasteners. We sell steel, stainless steel and brass screws, self tapping screws, self drilling screws, dry wall screws, hex nuts, hex bolts, rivets, anchors, nails, flat washers, spring washers, couplings and fixings. 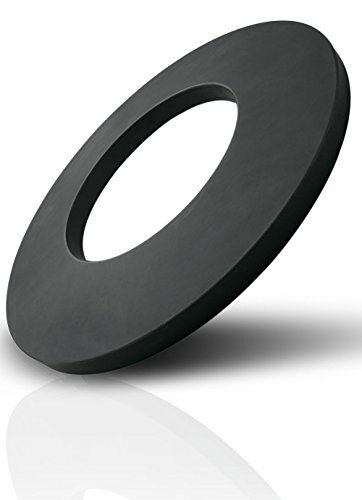 Disc springs are conically formed annular discs, which are loaded in the axial direction. 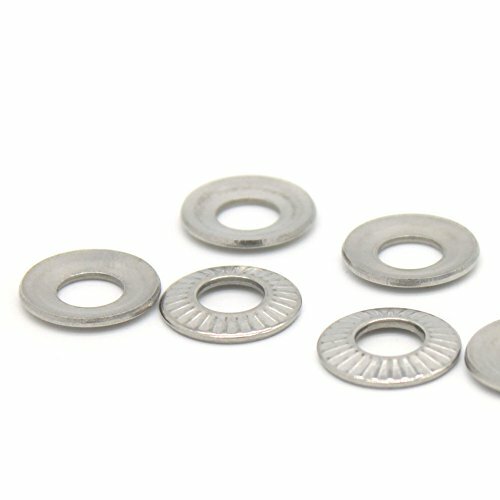 Disc Springs offer a well-developed solution to many engineering problems through a unique combination of high force in a small space. Disc Springs can be used as a single disc or arranged in stacks. A spring stack can consist of either single springs or parallel spring sets. Disc Springs are available with or without contact flats. Disc Springs are manufactured from forgings. We have computerized design programs to assist our customers for their specific applications. 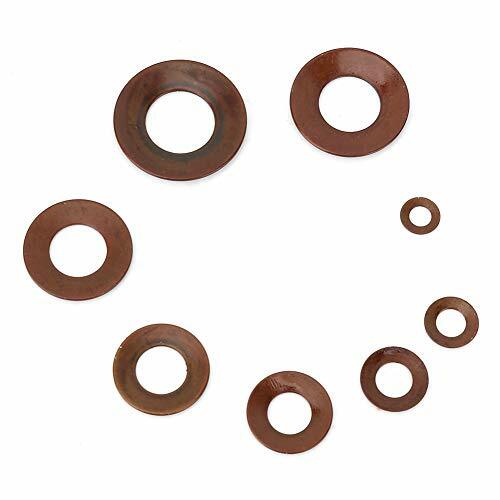 Disc Springs are mainly manufactured from Spring Steel material. 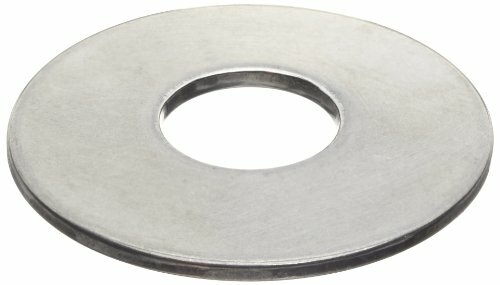 Our Belleville spring washers are especially suited for applications requiring high spring rates in restricted space they will occupy only a fraction of the compressed height space of a traditional wire spring. Belleville washers can be stacked in varying sequences (parallel and/or series) therefore offering numerous load-carrying possibilities. Stainless steel offers good mechanical properties, with greater corrosion and heat resistance than high carbon steel. Type 302 Stainless Steel per ASTM 5906 for Thickness 0.072"
Maximum Operating Temperature of 500 F (260 C) for type 302 and 550 F (290 C) for type 17-7 PH. HEAVY LOAD: With heavy load, short stroke and small space required, thiese springs are easy to use in combination. EASY TO REPAIR: Easy to repair and replace, high economic security, suitable for precision heavy machinery with small space and large load. LAGER DEFORMATION ENERGY: Disc spring has a larger deformation energy per unit volume than other types of springs. 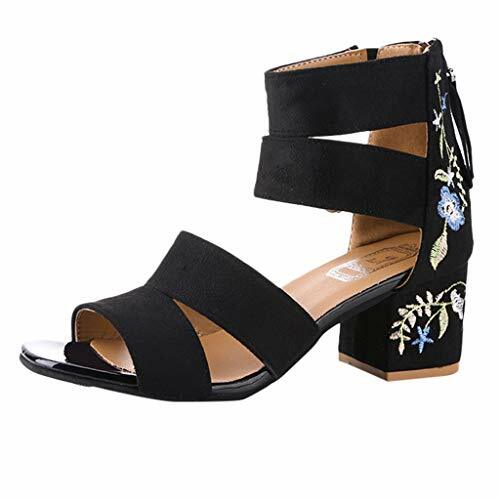 Has good buffer shock absorption capacity. SCOPE OF APPLICATION: The disc springs are often used as a strong buffer and shock absorber in heavy machinery, and it is also a compacting device for clutches, safety valves, pressure reducing valves, etc. VARIABLE STIFFNESS: The box of disc spring has variable stiffness characteristics. 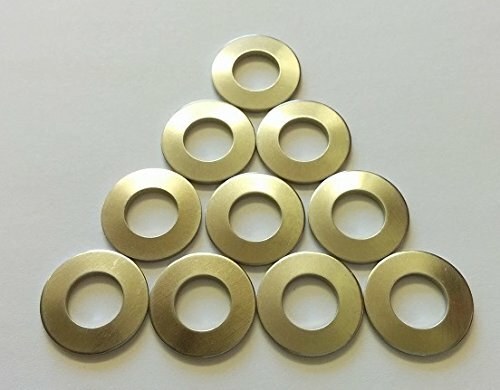 Easy to repair and replace, high economic security, suitable for precision heavy machinery, this flat washers set has many different size to meet with your demand. 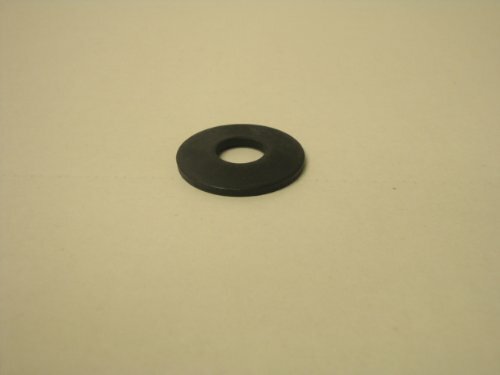 This style of disc spring has a larger deformation energy per unit volume than other types of springs and good buffer shock absorption capacity. 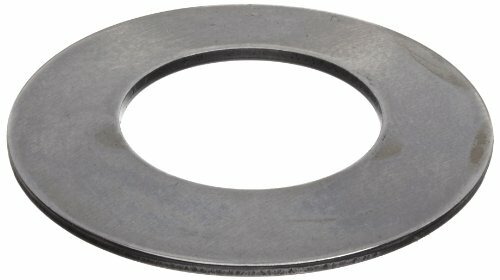 Made of high quality stainless steel, corrosion resistant, with variable stiffness characteristics, this disc spring is great for for electrical connections for home, automotive, and shop use.